Shown above, clockwise from 11 o’clock: French Plum, Italian Plum, Flavor Queen, Flavor Grenade, Howard’s Miracle. Center: Elephant Heart. Plum varietals and history are varied and fascinating, particularly in our climes. Midsummer is peak plum season in California. Part of the genus Prunus, plum varietals share characteristics with other stone fruits such as apricots, cherries, nectarines, almonds, and peaches. Typically harvested in August, plums prefer a warm but dry climate, but need winter’s chill (trees exposed to temperatures under 45 degrees Fahrenheit) to produce fruit. The American plum industry developed largely due to the efforts of 19th century Sonoma County botanist Luther Burbank, who traveled from the coast of Cape Cod to Santa Rosa in the 1870s and developed more than 100 varieties of plum. As one of the nation’s largest producers of plum varietals, Healdsburg’s history is interwoven with the success of the plum. Once known as the “Buckle of the Prune Belt,” today Healdsburg’s former plum orchards are mostly re-planted to grapes. Today the plummy legacy lives on in the local collegiate Prune Packers baseball club. 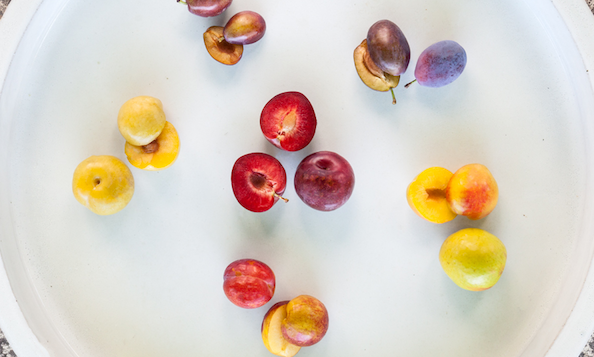 Below are some of our favorite plum varieties, with ideas on how to best capture their flavor right now, at the height of plum season. Considered the ideal dessert plum in Europe, the Green Gage was developed in 19th century Belgium. The smooth-textured amber fruit with rich candy-like flavor is excelled fresh, dried, or cooked. Not to be confused with an Asian plum called “Green Gage,” on this continent the Bavay varietal performs best in coastal California. Catalina plums are large, juicy, sweet, and deep purple in color, in both the skin and flesh. A market favorite with very little tartness at skin and pit, they are one of the best plums for fresh eating. This vigorous, productive tree does not need much winter chill to produce springtime flowers. This plum’s given name is a direct reference to its shape, noticeable weight, and deep purple red color. Elephant Heart plums yield a short shelf-life when ripe and are thus best utilized for fresh eating. Complementary flavors include vanilla, nutmeg, tropical fruits, figs, berries, citrus, and chiles. Savory pairings include cured pork, roasted lamb, and crudo-style fish and shellfish, cumin, basil, cilantro, hazelnuts, and cheeses such as burrata and manchego. Utilizing hand-pollination, Luther Burbank created the Elephant Heart plum from a Japanese variety in the early 20th century. It remains a boutique variety still grown by a limited amount of small farms, as it requires being hand-picked and -packed. With bright red skin and amber-colored flesh, the Emerald Beauty is known to produce large crops of fruit. Ripe fruit continues to sweeten on the tree, becoming exceptionally sweet, but remaining crisp and crunchy. California’s leading dried plum variety, the French Prune is a dark red-to-purplish fruit with tender, dark amber flesh. Medium-sized and egg-shaped, this fine-textured fruit has a rich, sweet flavor. These prune plums are also excellent for drying in the oven or electric dehydrator, or outside using our solar dryer. Howard Miracle trees bear good crops of large crimson and yellow sweet juicy fruit with notes of grapefruit or pineapple. Italian Prune plums are considered a multi-purpose fruit, as their ability to create a high concentration of fermentable sugars makes them the ideal candidate to create prunes. For more on drying plums, please read Drying Herbs and Fruits. They are also a commercial fruit crop used for the processing of cheeses and distilled alcohols, including brandy and wine. When cooked, the flesh turns fuchsia pink in color. Early blooming, yellow Shiros belong to the category of plum trees known as Japanese, and can be substituted for ume in preparing umeboshi. The medium sized greenish-yellow fruit is juicy and moderately sweet with a pleasing, mild flavor. A heavy bearer, Shiro grows clusters of plums all throughout the tree, and low-chill requirements make this plum well-suited to mild-winter locations. Developed in 1989 by Ziegler Genetics of Modesto, CA, pluots are a result of hybridizing plums with apricots. Called an interspecific cross, pluots have differing amounts of plum and apricot parentage and come in various sizes and colors of skin and flesh. Like most stone fruits, pluots thrive in regions such as the San Joaquin Valley and the eastern Mediterranean coast, where winter temperatures are cool but not cold and the summer season is long, warm, and dry. Pluots have the initial appearance of a mottled plum. Their colorings range from red-skinned and pale amber-skinned to ruby-fleshed and blazing gold-fleshed. Most pluot varieties are extremely sweet, often spicy, low-acid fruits with a juicy, chin-dripping tender firm flesh. Pluots, like other stone fruits, are best enjoyed fresh at their peak of ripeness. They may also be baked, roasted, sautéed, puréed or cooked for jams, compotes, ice creams, and reductions. Complementary flavors include vanilla, nutmeg, tropical fruits, chocolate, citrus, basil and chiles. Other favorable pairings include pork, lamb, grilled shellfish, and crudo-style seafood. The large, firm Dapple Dandy has a distinctive skin color that is pale green to yellow with red mottling and a creamy pink flesh. Dapple Dandy offers a spicy, plum-apricot flavor and a good acid to sugar balance. As the name suggests, this pluot has an explosive flavor. The pink to red blush of the fruit is most pronounced in colder climates, and the texture is much like an apple, even when the fruit is fully ripe. This pluot has 70 percent plum and 30 percent apricot heritage, and combines tastes of both parents with a higher sugar content. Flavor King has dark red-purple skin and sweeter, softer, and grainier flesh than a plum. The fruits are juicy and have a fragrant aroma, yet lack the tart flavor many plums have on the skin and near the center of the fruit. Flavor Queen has yellow-green skin and amber yellow flesh. The flavor is immensely sweet — a real treat for dessert. Superb texture with a juicy apricot aftertaste. Red plums and most pluots make a lovely base for a summer shrub, the refreshing drinking vinegar that we adore. Learn to make your own with the surprising addition of shiso leaves! This entry was posted in Eat Good Food and tagged plums, produce, summer. This is a terrific article. I was just writing about making claflouti and think about Santa Rosa plums (found a gorgeous description from Frog Hollow. Your list was wonderful. Thank you for doing this. I’m not even sure where you are–Healdsburg I guess. But can’t wait to visit. Hope you are able to visit, Margo! Thanks for the kind note.